Estep, Howard C. Nine Fruitful Life Series Evangelical Pamphlets: Ye Must Be Born Again (No. 35); Why Do We Cry? (No. 43); The Secret of Receiving (No. 44); Fundamental or Instrumental (No. 51); Won By One (No. 53); "It Is Toward Evening" (No. 58); Once Saved Always Saved? (No. 62); Mankind Needs Government (No. 64); Why Do The Wicked Live? (No. 65). Strobel, Lee. 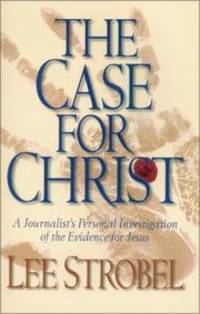 The Case for Christ: A Journalist's Personal Investigation of the Evidence for Jesus. From The Case For Christ to Master Plan Of Evangelism, from	Evangelism For the Rest Of Us to Good News and Good Works, we can help you find the evangelism books you are looking for. As the world's largest independent marketplace for new, used and rare books, you always get the best in service and value when you buy from Biblio.com, and all of your purchases are backed by our return guarantee. In his #1 best-seller The Case for Christ, legally trained investigative reporter Lee Strobel examined the claims of Christ, reaching the hard-won verdict that Jesus is God's unique son. But despite the compelling historical evidence that Strobel presented, many people grapple with serious concerns about faith in God. As in a court of law, they want to shout, 'Objection!' They say, 'If God is love, then what about all the suffering in our world?' Or, 'If Jesus is the door to heaven, then what about the millions who have never heard of him?' Or, 'If God cares for everyone, then why does he eternally torture some in hell?' In The Case for Faith, Strobel turns his tenacious investigative skills to the most persistent emotional objections to belief--the eight 'heart' barriers to faith. The Case for Faith is for those who may be feeling attracted to Jesus but who are faced with formidable intellectual barriers standing squarely in their path. For Christians, it will deepen their convictions and give them fresh confidence in discussing Christianity with even their most skeptical friends. Nicky Cruz is the best-selling author of fourteen books, including the Christian classic, Run Baby Run . Nicky is a minister and evangelist who has reached millions of people around the globe. Today he oversees Nicky Cruz Outreach, an international ministry to urban youth. The father of four daughters and grandfather of seven, he lives in Colorado Springs with his wife, Gloria. Visit his website at www.nickycruz.org. Frank Martin is an author and commentary writer for Focus on the Family. He collaborated with Nicky Cruz on his last book, One Holy Fire. Frank and his wife, Ruthie, live in Colorado Springs with their two children. Visit his website at www.frankmmartin.com .